On August 30th 2017, Tropical Storm IRMA emerged as a small, low pressure air mass off Cape Verde. Within a mere two weeks, the system had grown to a category 5 Hurricane and by the end of its rampage it had become the 5th most costly storm in the history of Atlantic hurricanes and the first on record to strike the Leeward Islands. The small low lying island of Barbuda, east of the island of Antigua, received a direct hit. With less than twelve hours to spare, the government authorities mandated an immediate and complete evacuation of the Island. Unlike the more elevated Antigua, Barbuda is only 146 feet above sea level at it’s highest point. The storm surge easily covered over half of the island. The only official wind gauge at the small airport was ripped from the roof of the two room Air Terminal building after registering 175 mph. Initial reports were wrenching. The island’s four major resorts were destroyed, including the exquisite K Club, a favorite get-a-way for Princess Diana and her two sons in the early 90’s. Without hospitality, Barbuda would become a welfare state. As an Architect and Firefighter, the news stirred me. I found a website for a small, family owned venue on the south shore of the island called The Barbuda Cottages, consisting of four beach front dwellings and a beach-side Restaurant. On the phone, I could hear a desperation in the Owner’s voice, but also a determination. She needed a plan for rebuilding, a plan for the future. To assist me I brought a 17 year old apprentice, named Lou, who had recently completed rehab. He had been assigned to me a for previous project through our local high school. Lou needed a change of scenery and I needed someone to hold the other end of the measuring tape. I suspected, but could not predict, how this trip would change his perspective on his role in the world. The Barbuda Cottages were an off shoot of “Uncle Roddy’s”, a beach side restaurant started by Kelcina’s dad, Roddy George, which sat off the main road from Coddington village on the way to Coco Point. Roddy had returned to the island of his birth after moving his large family to Toronto for better schools and steady work, as many inhabitants of British Commonwealth countries have done. But, his heart never left the island. Coming back had always been a dream that he and Kelcina shared. With her dad’s permission Kelcina and her Canadian boyfriend, Oliver, built and managed four guest cottages next to the restaurant. Their customers had included Canadians, Europeans and Americans interested in simple accommodations, great food and secluded beaches. For the design of the cottages, Oliver had studied the vacation homes on North Carolina’s Outer Banks, an area regularly hit by ocean storms. There, the beach houses are all built on wood pilings, a full story above the surrounding landscape. For this singular reason their cottages survived with only wind damage while the resorts and Roddy’s Restaurant were totally destroyed by the storm’s tidal surge and ensuing wave action. Metal shipping containers that had been secured on reinforced footing and used for storage had been strewn thousands of feet away onto neighboring properties. All leaf bearing vegetation had been stripped and most trees of any height had been torn from the ground by their roots. To date, there has been no provision for Barbudans to own land. That is changing. 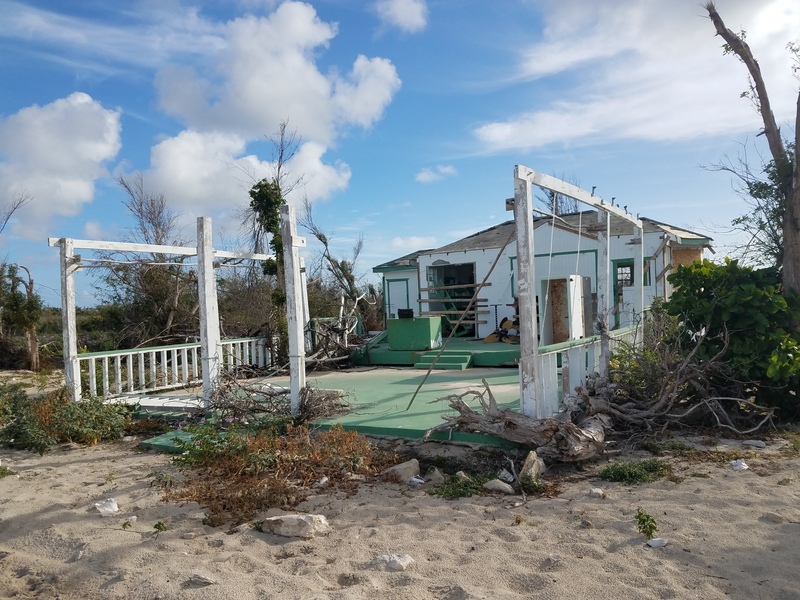 Since Hurricane Irma made it’s direct hit on the island, the Government in Antigua, which controls affairs on the much smaller Barbuda, has been looking for ways to encourage development and the prospects for new employment. Land Ownership by foreign investors is seen, by the majority in Antigua, as a probable and necessary concession. For now Kelcina, as a native born resident, still has a home court advantage. Their request was straightforward. They needed a Master Plan to rebuild and to establish their right to purchase the land they had developed. We set up in the one cottage equipped with a functioning generator. On top of a large coffee table, I taped down tracing paper and a large plot of an aerial photo showing the remaining structures and roads. Over the next 5 days we laid out a new system of driveways, a maintenance yard, an office/convenience store, 8 new cottages, a new restaurant with parking, a helipad, tennis courts, an orchard and vegetable gardens. In the middle of our stay, we received a visit from a prominent neighbor, Robert De Niro, who had purchased the K Club two years before. He and Kelcina have become allies in the rebuilding of the island and she has proved to be an invaluable consultant on local politics. In addition to preparing the Conceptual Master Plan, we collected soil samples, completed a measurement survey, collected trash, setup composting stations and transplanted vegetation. We were well fed despite the scarcity of local provisions. Each day would end with a relaxing sea bath with our hosts, watching the sun set and recounting the day’s progress. Friendships were bonded, as is often the case, when adversity reminds us of our responsibility to care for each other. As of this writing, Oliver and Kelcina are well along with their repairs at The Barbuda Cottages and intend to reopen for the Winter season. Our digital version of the Master Plan has been presented to the government Commissioners for approval and to establish a basis for the family’s ownership of the land. Lou and I owe a special thanks to the staff at Hudson Design whose professionalism made it possible for me to be away and whose skill produced the needed instruments of service for The Barbuda Cottages.